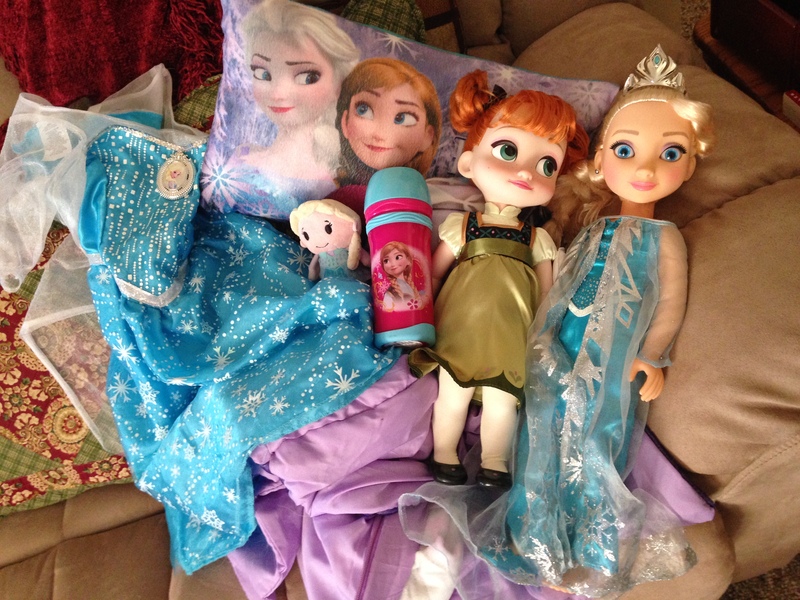 Just a small sampling of all the Frozen gifts Sophia got this year. If you don’t count the million-plus times I’ve enjoyed watching been tortured with watching Disney’s Frozen, you can say that I really didn’t have that much of Frozen in my life. Yeah, Sophia had a few dolls, a dress, and couple knick-knacks, and will sing “Let it Go” for hours on end, but now things have been taken to entirely new level. Folks, after this Christmas, I have officially been Frozen out. I’m not kidding. Like, at all. All of Sophia’s gifts were wrapped in Frozen wrapping paper. All she wanted from Santa were “an Elsa doll and an Elsa dress”. And, of course she got it, from her aunt and uncle. Did I mention that this specific dress lights up and plays “Let it Go”? Oh, I didn’t? Yeah, it does that. She wants to wear it to bed, all day long, inside, and outside. The song has played so many times that I’m ready to rip the battery out. And that’s only after two days… Christmas Eve–she got the doll and dress. Christmas Day–gifts wrapped in Frozen paper, Frozen pajamas, Frozen sheets, Frozen blanket, Frozen sleeping bag, Anna doll, Frozen water bottle, Frozen books, Frozen puzzles, Frozen games. And, ya know what? It’s not over yet. No. We do Christmas with my family and siblings this weekend and I KNOW she’s getting even more Frozen stuff. She’s even going to see Frozen on-ice with my sister and brother-in-law. Lucky for me, I won’t be going to that. I honestly don’t know if I could take it. I thought Frozen had hit its peak earlier in the year. But, no, Christmas brought it all back again. Did I mention that she’s already watched Frozen today? Yeah, because she has. And, the Frozen train doesn’t seem like it’s going to slow down any time soon, with the Frozen short coming out when Cinderella hits theaters in the spring. Have you tired of Frozen yet? Let me know in the comments, on Facebook, or Twitter! Don’t worry! It seems that the Frozen era is soon coming to an end…but something worse could come next! Ha. I’m about to publish a post about my son’s infatuation with Elsa tomorrow. It’s a double edge sword. On one hand, his obsession has allowed me a window for laundry, cleaning the kitchen or even finishing up emails, etc. On the other hand I’ve seen that freakin movie too many times! The definition of overkill. If I said I’ve watched it a million times, I don’t think it would be far-fetched at all!